The Cozy Cattail Cottage is a 2 bedroom vacation rental home furnished and designed for your home away from home comfort while visiting the Oregon Coast. We have 2 vacation rentals : The Cozy Cattail Cottage and The Cozy Cattail Cabin listing # 3853623 located on our 40 acres of secluded waterfront property comfortably designed for quiet nature loving travelers. Secluded yet only a pleasant 5 mile scenic drive to Reedsport to pick up groceries. The Cozy Cattail can serve as your base camp for exploring the central Oregon Coast. The Cottage is most comfortable for 2-4 persons but does sleep 6. It is a 2 bedroom home furnished with 2 Queensize Beds, a Futon and Twin Sofa Sleeper. Comforters, blankets, pillows, and clean sheets are supplied along with a washer and dryer. There are wall heaters in each room for convenient heat, a ceiling fan in the kitchen and a cozy woodstove in the living room with a little bit of wood for a cozy fire. A Portable Fan is also available for that rare day over 80 degrees. The kitchen is completely redone with Myrtlewood Cabinets and is fully supplied with stove, microwave, refrigerator, drip coffee pot, toaster, dishes, pans, utensils, and dish soap. Just bring the groceries. The bathroom is supplied with a shower/tub, hairdryer, clean towels, shampoo, conditioner, bodywash, and liquid soap. Let us know if you need a play pen or high chair for the little one. There is a Blueray/DVD player with a selection of movies for your enjoyment as well as a Bose Wave radio/CD player. A few games, puzzles and books are available for your use. The cottage has a landline for local, toll free and incoming calls. Intermittent cell phone reception is sometimes available at the chairs by the dock. There is NO internet, cable, or cell service at the Cottage. Free Wifi available in town at The Myrtlewood Gallery just ask us for the guest password. 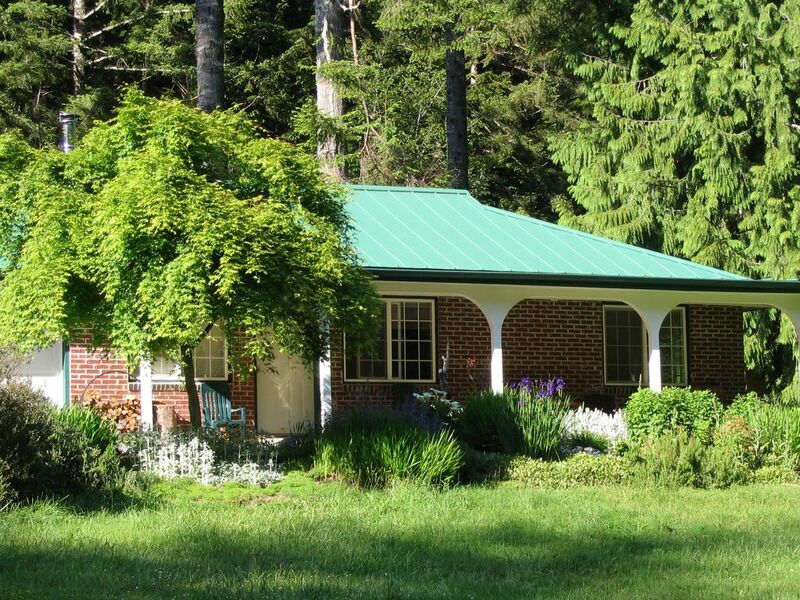 The cottage has a large covered porch with comfortable seating and a picnic table. A charcoal grill is available for your use. The Cottage allows pets with their well trained people. There is a $50 pet fee for up to 2 dogs. Please let us know if you are bringing a pet. We use special sofa covers when we have pet guests and provide extra pet towels for wiping all paws. For the comfort of Arya, the wildlife and our other guests we have a leash requirement for dogs that would otherwise run about and explore. Please keep your dog close and supervised at all times. And please Never leave them at the Cottage unattended. If you are traveling with more than one family you can also rent our other unit, The Cozy Cattail Cabin listing # 3853623, which is located ~100 yds from the Cottage and nestled behind the trees. (Pets, however, are Not allowed at the Cabin) Each unit would need to be booked separately. Trailers are NOT recommended. If you are bringing a trailer, be aware that we do have a 10ft wide bridge with tight corners and a difficult approach. Larger trailers are not recommended as you may have some difficulty with the inside corners. Trailers over 15 ft are Not recommended. Alternatively some guests prefer to moor their boats at Salmon Harbor Marina. It's more convenient than towing and launching your boat each day. Or we can arrange parking for your trailer on our lot in town. If there is anything else you might need, let us know. We strive to provide you with Home Away From Home Comfort. We respect your privacy but just live at the end of the road if needed. Be sure to schedule time sit back and relax surrounded by nature in the comfort of the CozyCattail Cottage. Owner and Manager of The Myrtlewood Gallery and the Cozy Cattail Vacation Rentals. We live at the end of the road on an awesome property and love to share the Cottage and the Cabin with visitors to our area. Centrally located between Florence and Coos Bay, The Cozy Cattail can serve as your base camp for exploring the central Oregon Coast. Our own little Shire nestled in the forest at the end of the road is 5 miles inland from the Ocean where we get about 50% more summer sunshine than Winchester Bay, less wind than Florence and the temperature averages about 10 degrees cooler than the valley. A wildlife sanctuary and a peaceful Coastal Retreat . Experience rural Oregon in a secluded coastal estuary and woodland setting. The Ocean is only 5 miles as the Crow Flies. 11 miles by car. We can hear the surf in the distance when a storm is rolling in. You can peek thru the trees to see the tide come in from the front porch. Our property borders the Hudson Slough/Frareys Creek which is about 100 yds from The Cottage. We have chairs for your use down by the waters edge. We have a good selection of DVDs but you get to take a vacation from the news,.. as there is no cable or satellite. There is a redbox in town for more movie rentals. Absolutely loved staying here, so much so that I am already looking to see if I can book for next year at the same time. Not only is the area stunning, but the house is cozy and quiet. So often I stay in rental homes and it is clear the owners have not really thought about what it is like to live in the rental--i.e. the beds are uncomfortable, the can opener doesn't work, the toilet makes weird noises at night--but these owners are clearly engaged and sensitive to providing a great experience for their guests. The beds are super comfortable--one is memory foam, the other is a superior mattress (no springs)-- the oven is large so if you have to cook for 6 people it can hold all of your dishes, there is heating in every room, and the freezer has several ice trays. I know these may seem odd to point out, but attention to detail in owners is key for those of us who stay for long periods of time. There is no wifi, which is a plus. There is not even the temptation to turn on your phone and we found ourselves napping and exploring the beautiful area instead. I brought my dog, and again the area was perfect for her. There are two very large grassy areas for her to run, play, take care of business on. The majority of the furniture was low and pet proofed, so easy for an older pet to hop on and get comfortable. The owner also kindly provided a dog bed for laying by the woodburner and several towels for wiping off muddy paws. Have to add that the cottage is nicely situated between Dune parks and beautiful places to visit on the Oregon Coast. loved the cabin warm and cozy in November perfect thanksgiving retreat with family. close to reedsport stores and food, easy drive to dunes and sights. A delightfully quiet experience. Lovely places to walk,sit ,meditate and simply"be"
Sharon is a friendly and helpful owner, sharing other travel ideas for the area. We visited the family owned Myrtlewood Gallery in Reedsport and were delighted by the artistry we found. Bring a book or dvd's because you won't be watching your t.v. programs. What a way to de-compress. Didn't want to leave. We loved it. Very clean, nice and quite, the place very nice , and clean inside. I will be going back. Had a great time. Thanks. We're located near the Oregon Dunes National Recreation area 'The Heart of the Dunes' Hike one of the many trails through the dunes. Fly a kite on the beach. Go beachcombing. Rent an atv or dune buggy and ride the dunes. Tour the Umpqua Lighthouse. Visit the Umpqua Discovery Center. Relax and enjoy the peaceful quiet of the countryside. Fish the local waters (sturgeon, stripe bass, salmon, sea perch,ling cod, sea bass, large mouth bass, small mouth bass, ......) or Charter a boat with a fishing guide to catch the big one. On our property: Hudson Slough/Frarey's Creek is about 100 yds from The Cozy Cattail. You can peek thru the trees to see the tide come in from the front porch. We have a tidal dock and a boat launch suitable for very small boats at high tide. We provide a couple of small fishing poles suitable for catching small fish. Damage Deposit is refunded to you after your stay. There is a $50 pet fee. Do not leave pet unattended at any time. No Smoking except out on the concrete porch. No Parties. We have a 10' wide bridge with a difficult approach. If pulling a trailer Please use caution!! Especially watch your right trailer tire arriving and watch your left trailer tire when departing. We recommend going slow and swing wide at the corners.